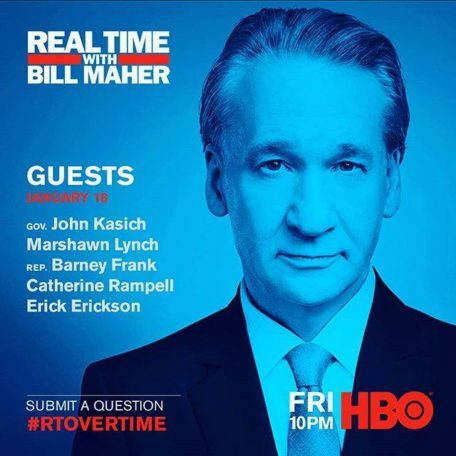 REAL TIME WITH BILL MAHER returns for its 17th season FRIDAY, JAN. 18 (10:00-11:00 p.m. live ET/tape-delayed PT), with a replay at midnight, exclusively on HBO. Allowing Maher to offer his unique perspective on contemporary issues, the show includes an opening monologue, roundtable discussions with panelists and interviews with guests. Former Ohio Gov. John Kasich is the top-of-show interview guest. Athlete Marshawn Lynch is the mid-show interview guest. The roundtable guests are radio host Erick Erickson, former Mass. Rep. Barney Frank and columnist Catherine Rampell. REAL TIME WITH BILL MAHER has been renewed through 2020. Maher headlined his first special on the network in 1989 and has starred in 11 HBO solo specials to date.